Dry Needling provides a fast effective route to pain relief, through the use of fine needles inserted into trigger points in muscles. The needles penetrate deep into knots of muscles, to relieve tension and increase blood flow to the region. They can hit stubborn knots with precision, even when the source of pain seems to be buried so deep as to be inaccessible to massage. Relaxing these trigger points can release long held pain. Because of their exact anatomical location on nerve pathways, they can also reach the roots of referred pain in, for example, whiplash or tension headaches. What is the difference between Dry Needling Acupuncture and Traditional Chinese Acupuncture? When a needle hits the right spot, there is usually a muscle twitch in response. It is important to distinguish here between Dry Needling (DN) and Traditional Chinese Acupuncture. At our clinic, we offer Dry Needling, based on modern medical science, and practiced only by those doctors and other qualified health professionals who have undertaken postgraduate training.Tradition Chinese Acupuncture works with Chi or Qi, in meridians, and diagnosis involves meridians, and has very little to do with western medicine. The difference to the patient is that a small number of very fine needles are inserted deep and directly into the muscles rather than just under the skin. In Traditional Chinese Acupuncture, there are usually more needles and they are just under the skin, and not only into muscle tissue. Dry Needling practitioners are skilled at finding exact trigger points with a high degree of precision. 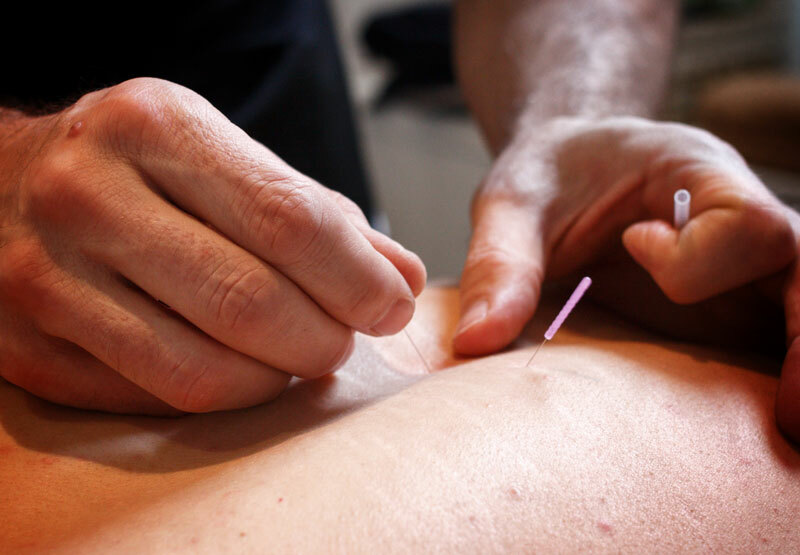 We can offer Dry Needling on its own, or as a component of Physiotherapy treatments. Because the needles are so fine, they cause very little pain but can be a little intense for 24-48 hours after treatment. For those patients who don’t like needles, we can offer trigger point massage. This is delivered by the same Physiotherapist, and has rather milder effect than the needles. Although it can take longer to achieve success than dry needling, trigger point massage can also be effective in pain relief, and it has the advantage that patients can be taught how to find and stimulate their own trigger points, to massage themselves.